At the start of the year, I was invited on a two-day trip to the Yarra Valley, visiting some of the breweries on the Yarra Valley Cider and Ale Trail, as well as local restaurants and providores. It was such a lovely trip, and a great opportunity for me to discover some places I wouldn't have known about otherwise. I've mentioned previously that I find it quite tricky to find out about good restaurants/cafes when visiting new regions, so always appreciate any recommendations and insider knowledge. 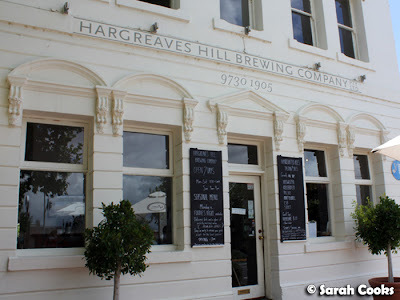 Lunch on the first day was at Hargreaves Hill Brewing Company. We started by having a chat with Beth Williams, who founded Hargreaves Hill with her partner Simon Walkenhorst in 2002. Both classically trained musicians, they decided to open a brewery and restaurant to provide a more stable upbringing for their children than a touring schedule would allow. They released their first ale, the pale ale, in 2004, and seem to have been doing pretty well since then! 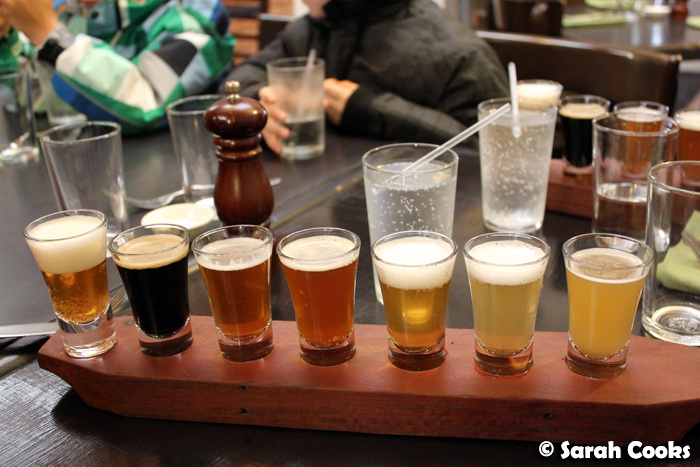 The restaurant offers a tasting paddle of the Hargreaves Hill beers for $8 - a great way to try out the range, especially if you're driving like I was! My favourite, unusually for me, was the stout. I normally don't like stout, having been put off in my early beer-drinking days by the thick, filling Guinness that almost smacks you in the face with its dark, beery intensity. However, the Hargreaves Hill stout was rather delicate, with a touch of sweetness and lovely hints of coffee and even chocolate. Beth suggested it as an unconventional accompaniment for chocolate cake, served in a Champagne flute - I love that idea! After the tasting, Beth bid us farewell and we got stuck into lunch. Hargreaves Hill has a small and well-thought out menu, focusing on modern interpretations of comforting pub food. This zucchini and herb salad was a fab little starter, which we shared between two. 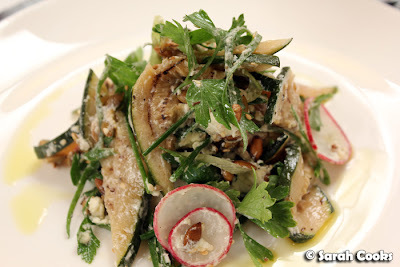 The Persian fetta (from the nearby Yarra Valley dairy) was gorgeous, and the dish provided pleasing contrasts between the soft zucchini, fresh herbs and crunchy toasted seeds. 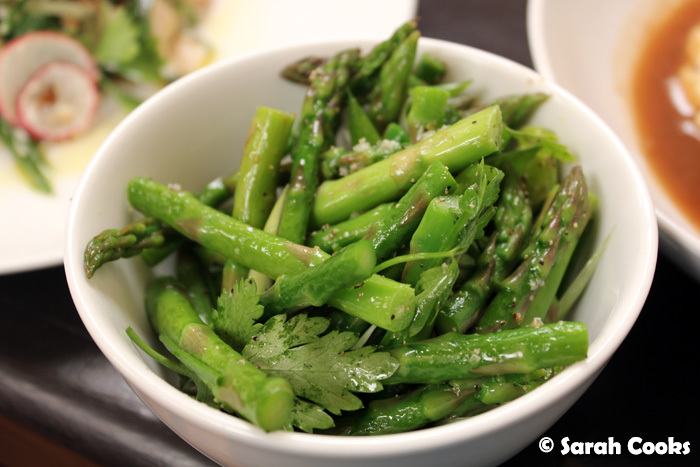 I love substantial salads, and this, with some bread on the side, would make a great light meal. I quite liked the novel presentation of the pie, almost like an upside down pie floater. 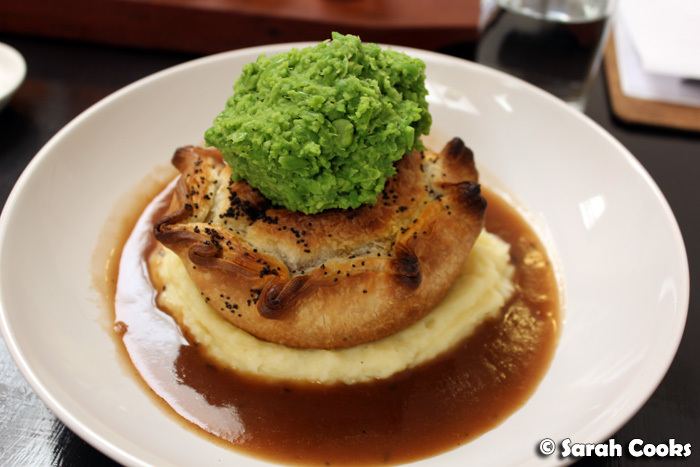 It was a very generous portion, with mushy peas, mashed potatoes, and gravy in addition to the pie. The pie itself was delicious too: tender pieces of lamb in a rich, dark sauce, encased in a flaky pastry. I couldn't resist ordering the pork belly. 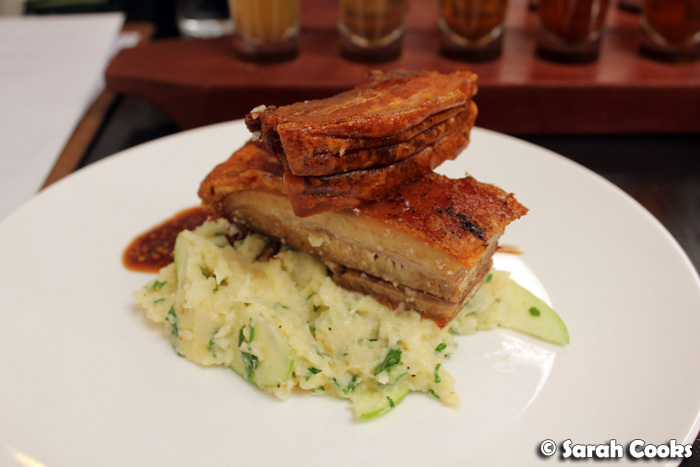 It was quite a rich lunch dish, but the parsnips and apple slices in the mash helped to offset the fattiness of the pork belly - a great combination. Whilst the meat was tender, and the top piece of pork was nice and crackly, the rind on the bottom piece of pork was unfortunately chewy. But perhaps that was a good thing, as I could easily have eaten both pieces of crackling otherwise! We ordered a side of buttered asparagus as well, but given how generous the servings were, we probably could have skipped these. The desserts on the menu looked very tempting, (passionfruit parfait with mango coulis and poached lychee, anyone? ), but we were too full to order them after that generous meal. I'll have to keep those desserts in mind for a future visit! Sarah and Sandra visited the Yarra Valley and ate at Hargreaves Hill as guests of Yarra Ranges Regional Marketing. 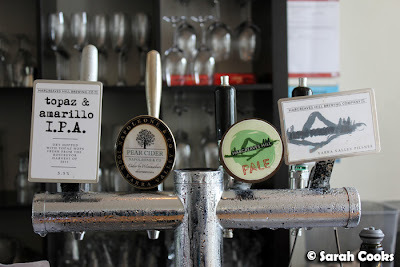 This is the first post from my Yarra Valley 2012 Trip series.